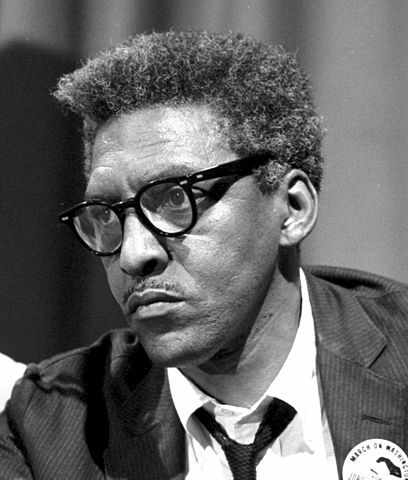 Introduction: Bayard Rustin served the trade union and civil rights movements as a brilliant theorist, tactician and organizer. 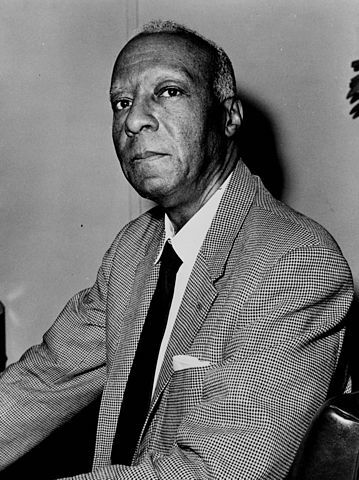 He conceived the coalition of liberal, labor and religious leaders who supported passage of the civil rights and anti-poverty legislation of the 1960s and, as the first executive director of the AFL-CIO’s A. Philip Randolph Institute, he worked closely with the labor movement to ensure African American workers’ rightful place in the House of Labor. Early Years: Born in West Chester, Pa., on March 17, 1912, Rustin was raised in a close-knit African American household by his maternal grandparents, Janifer Rustin, a caterer, and Julia Davis Rustin, a nurse and charter member of the National Association for the Advancement of Colored People. The young Rustin excelled in academics, music and sports at the integrated West Chester Senior High School and was elected class valedictorian his senior year. On a high school road trip, he insisted that black players be put up in the same hotel as white players, and at least once he sat in the “whites only” section of the local movie theater, for which he was arrested. Rustin attended Wilberforce University in Ohio, and Cheney State Teachers College. Rustin decided to dedicate himself to the cause of peace and civil rights. In 1937, he volunteered with the American Friends Service Committee (AFSC), a Quaker pacifist group. After moving to New York City in 1938, Rustin joined the Young Communist League—which he broke from in 1941 when the Communists reversed their anti-war policy after Nazi Germany invaded the Soviet Union—and enrolled at the City College of New York. Rustin briefly joined the March on Washington movement as a youth organizer in A. Philip Randolph‘s campaign to end racial discrimination in the nation’s defense industries. In August 1941, as a member of an AFSC delegation to Puerto Rico, Rustin investigated the problems of conscientious objectors. He then joined staff of the Fellowship of Reconciliation, a nondenominational pacifist group. In 1942, Rustin assisted James Farmer in founding the Congress of Racial Equality (CORE), an interracial civil rights organization, serving as its first field secretary. Rustin spent 28 months in federal prison after being arrested in 1943 when, as a conscientious objector, he refused to report to his draft board for a physical examination. Career: After his release, Rustin became chairman of the Free India Committee and later spent six months in India observing and studying Gandhi’s movement. In 1947, Rustin participated in the first Freedom Ride across the South to protest the segregation of interstate bus travel. In Chapel Hill, N.C., local authorities charged Rustin and three white protesters with violating the state’s segregation laws. Convicted, they were sentenced to 30 days of hard labor on a chain gang. Rustin’s description of his ordeal in the New York Post sparked prison reform in the state and led to abolition of the convict labor system there. After the 1947 Freedom Rides, A. Philip Randolph asked Rustin to direct his Committee Against Discrimination in the Armed Forces, which helped convince President Truman to desegregate the armed forces in 1948. Rustin traveled toGhana, Nigeria and South Africa, advising leaders on their planned nonviolent civil disobedience campaigns for liberation and later helped organize the Campaign for Nuclear Disarmament’s first annual protest march in England. Rustin’s most significant contributions would occur in the civil rights arena, however, where he served as the chief tactician of the movement. In 1955, Rustin worked with Dr. Martin Luther King Jr. to organize the successful boycott of the segregated local bus system in Montgomery, Ala., and for the next five years he remained King’s special assistant and close adviser. In 1957 he helped create the Southern Christian Leadership Conference. 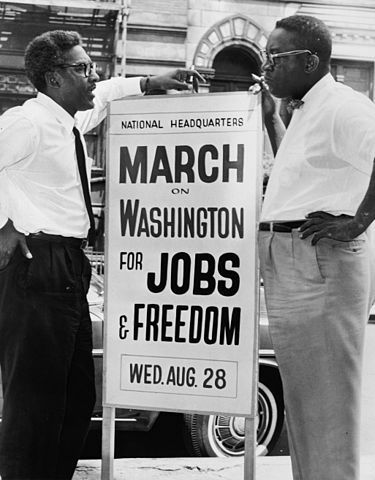 In 1963, A. Philip Randolph asked Rustin to help him organize a massive “March on Washington for Jobs and Freedom” to mark the 100th anniversary of the Emancipation Proclamation. Rustin’s left-wing past and sexual identity (Rustin had never hidden his homosexuality) made him a controversial figure for many of the more conservative members of the coalition Randolph wanted to bring together. To placate them, Randolph accepted designation as the march’s official director, but he appointed Rustin to be its chief organizer. It was an inspired choice. The gathering is most often remembered as the setting for King’s famous “I Have a Dream” speech. But it also helped secure passage of the Civil Rights Act of 1963 and the Voting Rights Act of 1964. In 1965, with a founding grant from the AFL-CIO, Rustin launched the A. Philip Randolph Institute (APRI) to forge an interracial coalition that would promote racial justice and secure jobs and freedom for all Americans. He served as APRI’s executive director from 1965 until 1972 and as its honorary president until his death in 1987. Under Rustin’s leadership, APRI announced a “Freedom Budget” that proposed to eliminate poverty in 10 years, conducted a nationwide voter registration campaign and ran a successful program to prepare people of color for apprenticeships in the building trades. In 1984, Rustin was arrested after participating in a “silent demonstration” in support of the pay equity demands of striking clerical workers at Yale University. In July 1987, Rustin became ill after returning from a mission to Haiti, where he had studied the prospects for democratic elections. Suffering from a perforated appendix that was tragically misdiagnosed, Rustin died a month later. He was 75.